The ingredients for salsa verde are in season now and if you want to add value, try fermenting it. For thousands of years people of all cultures fermented food as a way of preserving it. Sauerkraut, dill pickles, yoghurt, miso, kimchi, soy sauce, tempeh and sourdough bread are all fermented, and most will last for months in your fridge. The industrial food system put an end to much of our fermented food consumption. Factories found it more convenient to cook dill pickles in vinegar instead of creating that sour pickle flavour through natural fermentation. Big corporate food suppliers still naturally ferment sauerkraut, but then they kill all that carefully cultured beneficial bacteria by heat processing it. Fermented foods are raw and alive with bacteria that are good for your gut. Studies about the benefits of eating fermented foods are numerous, as are web sites with instructions to ferment practically anything. Food is naturally covered in good bacteria that, given the right growing conditions, will thrive in your ferments, increasing available nutrients and adding flavour. 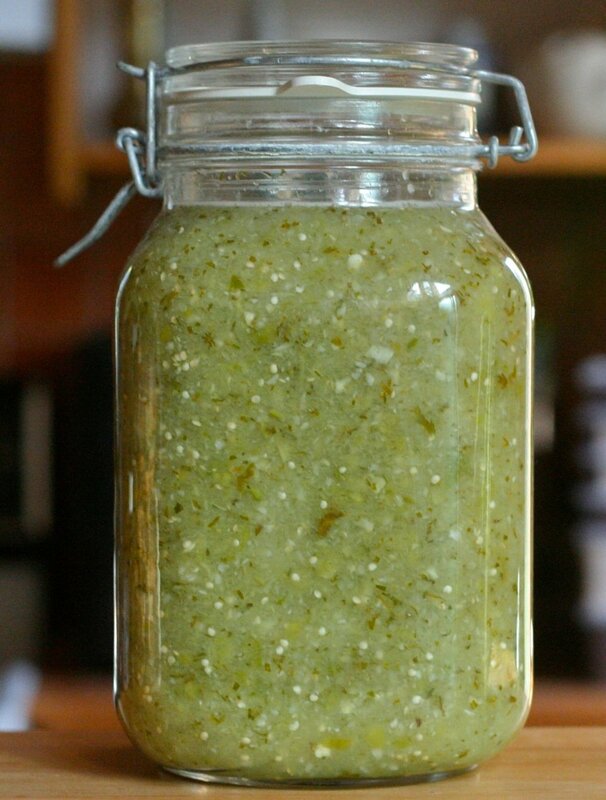 Salsa verde is a beginner fermentation – easy to make and unlikely to go wrong. Ingredient proportions are variable, according to your own taste. The only rule you don’t want to mess with is the salt to liquid ratio. Too little salt, and the good bacteria could be overwhelmed by spoilage bacteria. Too much salt and it’ll taste, well, too salty, and it will take a long time to ferment. Liquefy everything in a blender or food processor. If you have no machine to do this, chop everything fine and pound to mash and release juices. Add 1 tablespoon of sea salt to each litre of salsa. Don’t use iodized salt as it may inhibit fermentation. If you use coarse pickling or kosher salt, use more than 1 tablespoon. Put your ferment into a jar with a tight lid, leaving a 1-inch air space on top. Leave at room temperature for at least a few days – longer is better for higher bacteria content. The only way to know if it’s fermented to your liking is to start tasting it. When it’s just right, eat it or store in the fridge to slow fermentation. Good jars for fermenting have rubber rings and bale-type lids that allow fermentation gasses to escape and prevent air from entering. Lots of people use Fido jars or similar European canning jars. Any jar will do to get you started. If you don’t have a bale-type jar and you’re worried about it exploding, ease off the lid just a bit now and again to release pressure. I’ve never had a jar explode.